The city of Marseille has activated public spaces by the waterfront with commissions from artists such as Kader Attia and Bernar Venet to mark its year as European capital of culture. On the vast open lawns at the Palais du Pharo, Bernar Venet’s Disorder, 84 Arcs, 2013 consists of a series of twelve four meter high steel sculptures. The artist has placed the works so visitors can sit on the lawns amongst the sculptures or take views of the old port and city from the gardens. Algerian born, French artist Kader Attia has been given a previously inaccessible site on the old sea wall opposite the new MUCEM to realize his installation. 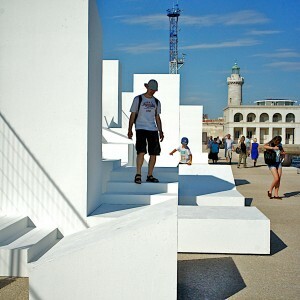 Les Terrasses at the Digue du Wall is a series of white-washed terraces creating an architectural sculpture that stretches along the lower section of the sea wall with places for visitors to climb or sit on and observe the city from a previously unavailable site. Also visible from the coast, the piece becomes a new point of perspective in the landscape, like a poetic beacon and linear form that changes constantly with the light. The reappropriation of the space is inspired by the architectural tradition of the Mediterranean and the modern aspect of the constructions on the north coast and the roof terraces of North African houses, missing only the TV satellite dishes and antennas. Attia’s references are clearly influenced by his personal history and a life lived between the ports of Marseille and Alger as well as by the architecture of Fernand Pouillon and Le Corbusier. Attia’s work resonates with Le Corbusier’s words of architecture as the “magnificent play of masses brought together in light”. Digue du Wall, (Sea Wall) is reached by a free boat daily near the MUCEM until the end of September.